This colour forecast is a wildly creative response to the many rigid and impersonal interior layouts of our day and age. 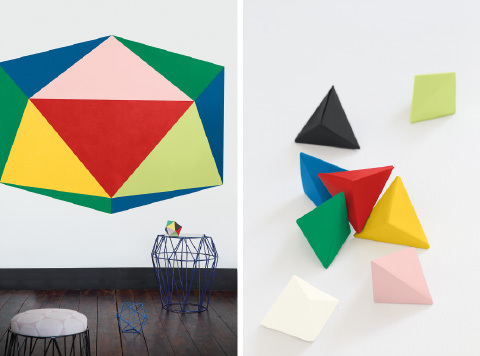 The CONNECT colour forecast is all about abstract collages and bold geometric forms. And giving them their upbeat energy and optimism are a mixture of pastel colours to create a summery vibe as long-lasting as our paints. The age of the internet has changed the way we live our lives, making us spend less time on aesthetic details and more on the volume of our experiences. That’s why we’ve taken inspiration from the Purism art movement and the Memphis design collective. These influences perfectly capture the power and beauty of basic, everyday objects that we’ve come to take for granted. Purism and Memphis focus strongly on basic geometry. The CONNECT colour forecast uses colours that represent the absolute beauty of life. Pastels such as Golf Greens (G4-A1-1), Light Reflection (Y6-A3-3) and Panorama Lights (Y4-A1-2) are contrasted with the more dramatic Dark Onyx (EC 42) and Strawberry Daiquiri (EC 100). This contrasting mix brings attention to shape and form.